This high performance Antares barlow # UB2STL doubles the power of any inserted eyepiece. It features a fully-multicoated achromatic design. This short barlow will work in diagonals or reflectors, has internal darkening and edge-blackened lenses, and is parfocal with most eyepieces. 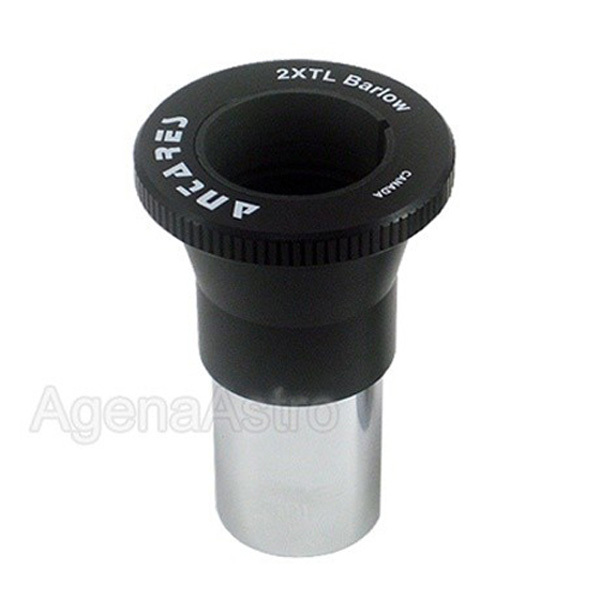 Suitable for high contrast, high power applications in any telescope. Threaded to accept standard 1.25" astronomy filters. Made in Canada. This new version of Antares' popular UB2S barlow features an integrated twist-lock adapter / clamping mechanism to securely center and hold your eyepiece. The inner compression ring is made of polypropylene and will not mar your eyepieces. Unscrewing the twist-lock ring exposes a standard male T-thread (M42x0.75) underneath which can be used to couple imaging devices with the barlow. 5.0 Very Nice at this Price! The 1st thing I liked was the self-centering twist lock feature instead of thumb screws that can move an eyepiece off axis. It's made in Canada and has fully multi-coated glass, and internal darkening and blackened lens edges to increase contrast. Remove the twist top and the unit doubles as a T-adapter. At less than $60, what's not to like?